Catalase, with the heme in red and the central iron in green. Living with oxygen is dangerous. We rely on oxygen to power our cells, but oxygen is a reactive molecule that can cause serious problems if not carefully controlled. One of the dangers of oxygen is that it is easily converted into other reactive compounds. Inside our cells, electrons are continually shuttled from site to site by carrier molecules, such as carriers derived from riboflavin and niacin. If oxygen runs into one of these carrier molecules, the electron may be accidentally transferred to it. 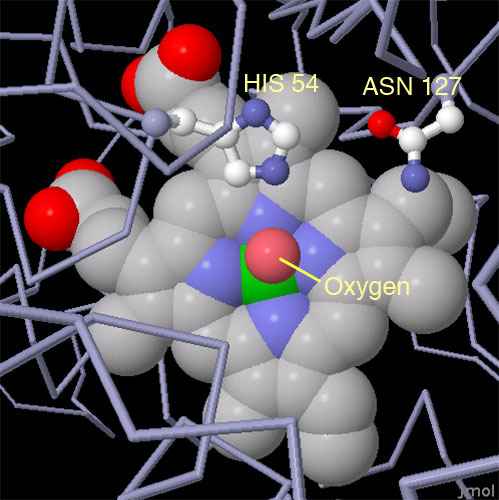 This converts oxygen into dangerous compounds such as superoxide radicals and hydrogen peroxide, which can attack the delicate sulfur atoms and metal ions in proteins. To make things even worse, free iron ions in the cell occasionally convert hydrogen peroxide into hydroxyl radicals. These deadly molecules attack and mutate DNA. One theory, still controversial, is that this type of oxidative damage accumulates over the years of our life, causing us to age. Fortunately, cells make a variety of antioxidant enzymes to fight the dangerous side-effects of life with oxygen. Two important players are superoxide dismutase, which converts superoxide radicals into hydrogen peroxide, and catalase, which converts hydrogen peroxide into water and oxygen gas. The importance of these enzymes is demonstrated by their prevalence, ranging from about 0.1% of the protein in an Escherichia coli cell to upwards of a quarter of the protein in susceptible cell types. These many catalase molecules patrol the cell, counteracting the steady production of hydrogen peroxide and keeping it at a safe level. Catalases are some of the most efficient enzymes found in cells. Each catalase molecule can decompose millions of hydrogen peroxide molecules every second. The cow catalase shown here (PDB entry 8cat ) and our own catalases use an iron ion to assist in this speedy reaction. The enzyme is composed of four identical subunits, each with its own active site buried deep inside. The iron ion, shown in green, is gripped at the center of a disk-shaped heme group. Catalases, since they must fight against reactive molecules, are also unusually stable enzymes. Notice how the four chains interweave, locking the entire complex into the proper shape. Catalase diversity: human erythrocyte catalase (left), bacterial HPII (center), and bacterial manganese catalase (right). Different cells build different types of catalase. Many are available for study in the PDB. The catalase that protects our red blood cells, shown on the left from PDB entry 1qqw , is composed of four identical subunits and uses a heme/iron group to perform the reaction. Many bacteria scavenge hydrogen peroxide with a larger catalase, shown in the center from PDB entry 1iph , that uses a similar arrangement of iron and heme. Other bacteria protect themselves with an entirely different catalase that uses manganese ions instead of heme, as shown at the right from PDB entry 1jku . For more information on catalases from a genomic perspective, take a look at the Protein of the Month at the European Bioinformatics Institute. Catalase performs its rapid destruction of hydrogen peroxide in two steps. First, a molecule of hydrogen peroxide binds and is broken apart. One oxygen atom is extracted and attached to the iron atom, and the rest is released as harmless water. Then, a second hydrogen peroxide molecule binds. It is also broken apart and the pieces are combined with the iron-bound oxygen atom, releasing water and oxygen gas. PDB entry 2cag has captured catalase in the middle of this two-step reaction. The oxygen atom is bound to the iron, ready for the second hydrogen peroxide molecule to bind. The histidine and asparagine amino acids shown here assist with the reaction. Click on the image to explore this structure in an interactive JSmol. P. Chelikani, I. Fita and P. C. Loewen (2004) Diversity of structures and properties among catalases. Cellular and Molecular Life Sciences 61, 192-208. J. A. Imlay (2003) Pathways of oxidative damage. Annual Review of Microbiology 57, 395-418. P. Nicholls, I. Fita and P. C. Loewen (2001) Enzymology and structure of catalases. Advances in Inorganic Chemistry 51, 51-106.